Every year, to commemorate the “Kristallnacht” pogrom of 1938, UNITED coordinates the International Day Against Fascism and Antisemitism on 9 November. Each year we call on NGOs, community organisations, schools, local municipalities – and you – to join forces and confront hate with direct action. On 9 November, we remember the terrible crimes committed by European fascists in the 1930s and 40s. Across Europe, millions of people were murdered simply for their religion, ethnicity, sexual orientation, perceived disabilities or political views. But even in those terrible times, there were people who resisted against fascism, even at great personal cost. Today, we are also living through uncertain and fearful times. Throughout Europe, right-wing populists feed and capitalise on fear of migrants, refugees and Muslims. Meanwhile, discrimination and prejudice against other minorities such as Jews and Roma is also increasing in many parts of Europe, and does not get the attention that is required of such pressing issues. But still, many people choose to stand up and show their opposition to such views. The work of Human Rights Superheroes is more important than ever. For the 2016 campaign, UNITED focused on the theme of Human Rights Superheroes. On the 9 November campaign day, we published profiles of heroes from past and present who stood up for the rights of others, and against hate – often paying a great price for their bravery. 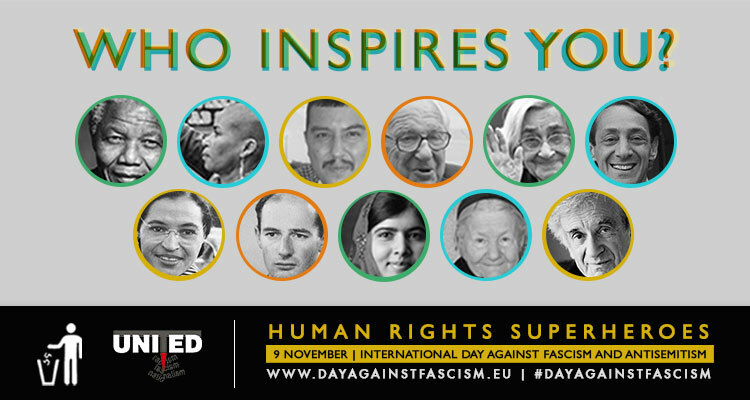 By highlighting the great contributions made by these individuals in past and present, we showed that we don’t have to hate and inspired people across Europe to take a stand against fascism and discrimination. As every year, we invited mayors and other city representatives to get involved with the campaign by telling us about the Human Rights Superheroes that inspire them. More information can be found on the cities page. This campaign was made possible with support of the Council of Europe (European Youth Foundation) and the Erasmus+ Programme of the European Union.